Catering first aid kits are an essential item for any area where food is handled or prepared, making it a popular choice for restaurants, pubs, canteens etc. 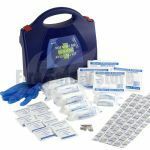 Our first aid kits include all the products you need to comply with Heath and Safety Executive (HSE). Our kits are specifically designed for catering environments, including an airtight lid that protects its components from grease and steam. We stock a range of catering first aid kits to suit all food handling situations. The difference between the sets is the sizes which have been particuarly created based on the amount stated in the description.